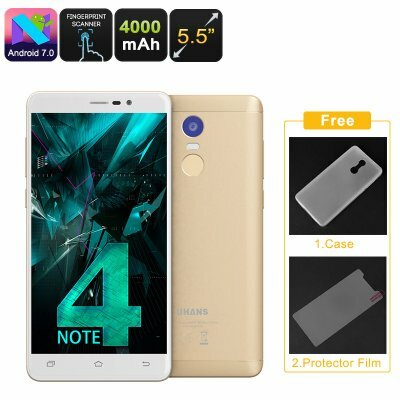 Successfully Added Uhans Note 4 Android Smartphone - 5.5-Inch, Quad-Core CPU, 3GB RAM, Android 7.0, Dual-IMEI, 4G, 13MP Camera, 4000mAh (Gold) to your Shopping Cart. The Uhans Note 4 is a cheap Android phone that treats you to ultimate connectivity. With its two SIM card slots and Dual-IMEI numbers, it lets you stay connected to two network providers at the same there. This means that you can be reachable on two phone numbers while using merely one device. For those of you that wish to separate both work and private life in one Android phone, the Uhans Note 4 is perfect. It furthermore supports 4G connectivity. This means you’ll be able to browse the web at lightning speeds no matter where you’re at. With Android 7.0, this cheap smartphone lets you smoothly enjoy the latest software features. It comes with a Quad-Core processor that has been clocked at 1.25GHz and 3GB RAM. This means that your phone can tackle all the basic Apps and games out there without you needing to worry about slowing it down. You’ll furthermore be treated to 32GB internal storage and 128GB external memory support. Therefore, you’ll have all the needed storage at your disposal to keep all your favorite media and files with you at all times. A beautiful 5.5-Inch HD display treats you to crisp visuals in 720p resolution. With its IPS technology, it treats you to sharp details and vivid color no matter your viewing angle. Thanks to the phone’s 4000mAh battery, you can watch movies and browse the web for 8 hours in a row. This will get you through the longest of days without ever needing to feel bored again. The phone furthermore treats you to a professional-grade 13MP rear camera. With this snapper at your side, you’ll be able to shoot stunning pictures and video of all your upcoming adventures. The Uhans Note 4 smartphone comes with a 12 months warranty, brought to you by the leader in electronic devices as well as wholesale Android Phone..